The Huff Run Watershed Restoration Partnership (HRWRP) recently began construction of the Mineral Zoar AMD Restoration Project. Their latest project is located just northwest of Mineral City on Mineral City-Zoar Road near its intersection with Sandyville Road. The site consists of a large existing wetland and two mine entries discharging toxic water with very low pH readings and high contents of metal. Water from the wetland enters Huff Run’s longest tributary that runs through the Mineral City Park right behind the HRWRP offices. A grant from the Office of Surface Mining for $110,000 administered by Crossroads RC&D, along with match and in-kind time from the Ohio Department of Natural Resources, will fund the Restoration Project. The total project costs will amount to approximately $416,000. The project will involve the construction of a reverse alkaline producing system (RAPS), a second wetland, improvements to the existing wetland and small open limestone channels. There have been many successive alkaline producing systems (SAPS) constructed to treat acid mine drainage in many different watersheds, but this RAPS is the first in our area (and possibly in the state of Ohio). This RAPS system will feed water from one of the mines via a series of pipes, first through a system of compost and then into the enhanced wetland moving the reverse direction as a SAPS. Between the RAPS, the new wetland and limestone, the Mineral Zoar AMD Restoration Project is projected to restore much of the affected tributary. 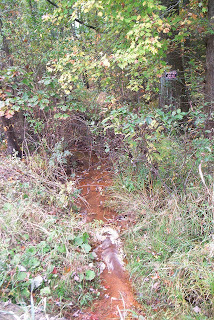 It is estimated that the project will remove all acid loadings and significantly reduce metals entering Huff Run itself through this tributary. Beaver Construction of Canton won the bid for the project and has been working since early April. The project has a small footprint, but construction is expected to take the duration of the summer. 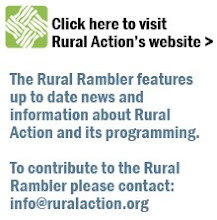 For more information on HRWRP, contact Maureen Wise (maureen@ruralaction.org) or call their offices (330.859.1050).